I prefer the Sweet Orange Shampoo from Andalou Naturals only because I don't have to use conditioner with that product, but 2chic Ultra Volume Shampoo with Tangerine & Papaya Butter by Giovanni Cosmetics is a very good product in its own right. 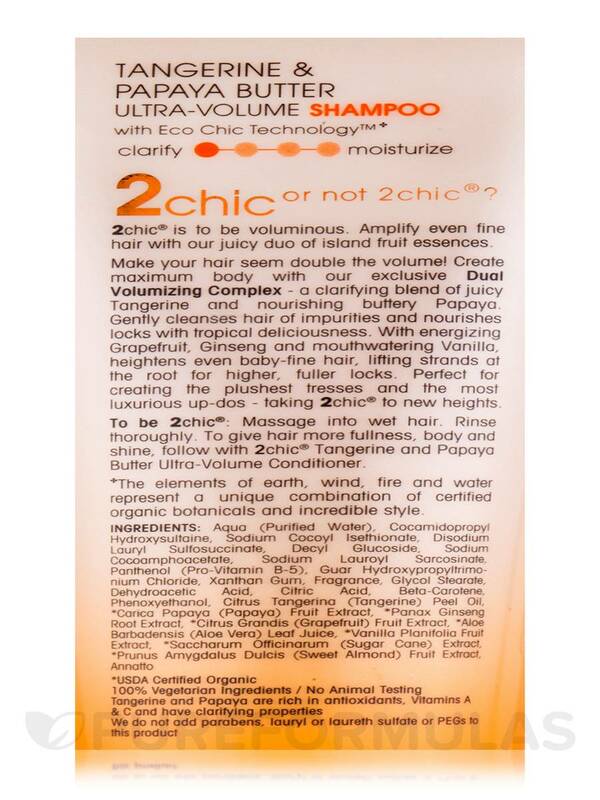 2chic® is to be voluminous. Amplify even fine hair with the juicy duo of Island fruit essences. Make your hair seem double the volume! Create maximum body with this exclusive Dual Volumizing Complex a clarifying blend of juicy Tangerine and nourishing buttery Papaya. Gently cleanses hair of impurities and nourishes locks with tropical deliciousness. With energizing Grapefruit‚ Ginseng and mouthwatering Vanilla‚ heightens even baby-fine hair‚ lifting strands at the root for higher‚ fuller locks. Perfect for creating the plushest tresses and the most luxurious up-dos - taking 2chic® to new heights. Aqua (purified water)‚ cocamidopropyl hydroxysultaine‚ sodium cocoyl isethionate‚ disodium lauryl sulfosuccinate‚ decyl glucoside‚ sodium cocoamphoacetate‚ sodium lauroyl sacrosinate‚ panthenol (pro-vitamin B-5)‚ guar hydroxypropyltrimonium chloride‚ xanthan gum‚ fragrance‚ glycol stearate‚ dehydroacetic acid‚ citric acid‚ beta-carotene‚ phenoxyethanol‚ citrus tangerina (tangerine) peel oil‚ *carica papaya (papaya) fruit extract‚ *panax ginseng root extract‚ *citrus grandis (grapefruit) fruit extract‚ *aloe barbadensis (aloe vera) leaf juice‚ *vanilla planifolia fruit extract‚ *saccharum officinarum (sugar cane) extract‚ *prunus amygdalus dulcis (sweet almond) fruit extract‚ annatto. 100% Vegetarian Ingredients / No animal testing. No added parabens‚ lauryl or laureth sulfate or PEGs to this product. Massage into wet hair. Rinse thoroughly. 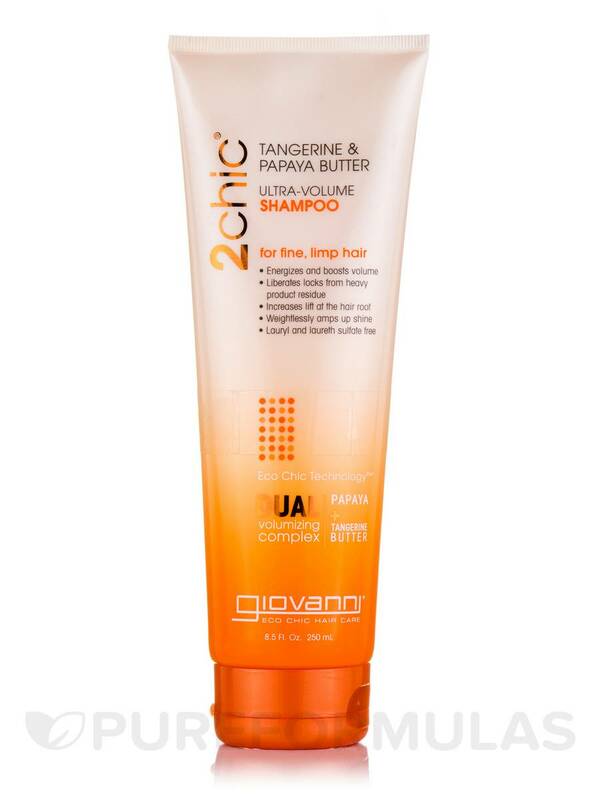 I like the ingredients in 2chich Ultra Volume Shampoo with Tangerine & Papaya Butter by Giovanni Cosmetics, and it conditions well! Very good product at good price! Leaves hair clean and smelling nice. Excellent price. 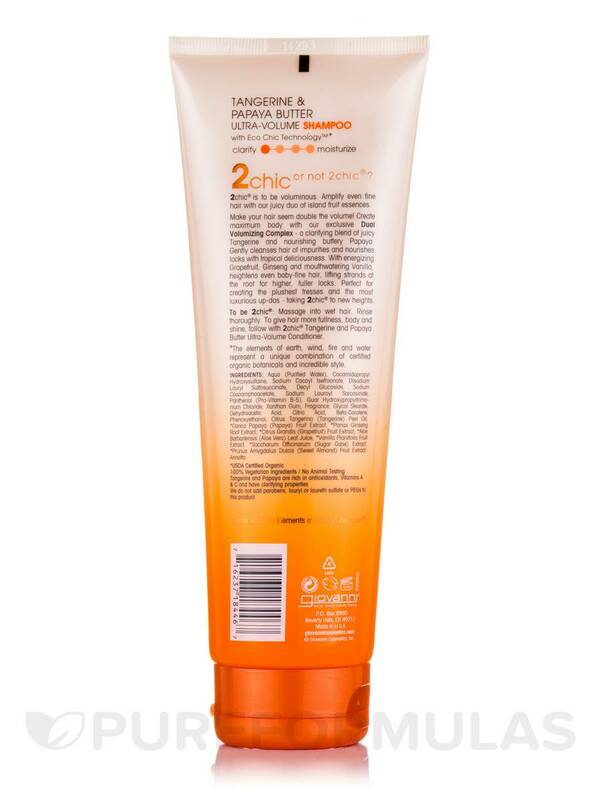 2chich Ultra Volume Shampoo with Tangerine & Papaya Butter by Giovanni Cosmetics is a magic potion that makes my whole family's hair shiny, supple, lightweight, voluminous and sleek- the curlies, the wavies, the thicks and the fines. And it smells like an upscale mall type product; delicious.